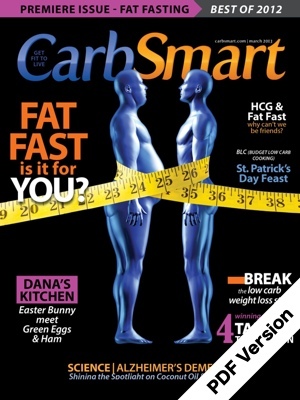 CarbSmart Magazine #01: Focuses on the Fat Fast & Best of 2012. The articles in this issue will help walk you through strategies for getting your weight loss back on track. The Fat Fast — is it for you? A radical, short-term strategy, the fat fast can break through metabolic resistance to weight loss. We’ve all been there. We’re going merrily along our low carb way, losing weight, then bam! A stall. Argh. Here are some ideas for getting past it. Dana tries the Fat Fast to see what Dr. Atkins was talking about. Can You Do The HCG Diet And Fat Fast — At The Same Time? The HCG protocol has been popular in the past few years. It involves not only HCG, but an ultra-low calorie diet that is also pretty low carb. But can you swap out the 500 calorie per day Simeons protocol for a 1,000 calorie per day fat fast? You see the dire headlines, but what do those studies really mean? For thirty-odd years now we’ve been getting the message to eat a low fat, low cholesterol diet. How’s that working out for us?